Large Protests In Hundreds Of Cities Vent Ire Over Climate Change : The Two-Way The People's Climate March was timed to draw the notice of world leaders gathering for this week's U.N. Climate Summit in New York. Demonstrators gather near Columbus Circle before the start of the People's Climate March in New York Sunday. Organizers are hoping 100,000 people worldwide might participate in the rally. Streets in New York City and other towns were taken over by marchers Sunday in what organizers called the largest climate change protest in history. The People's Climate March was timed to draw the notice of world leaders gathering for this week's U.N. Climate Summit. Overall, organizers estimated around 310,000 people joined the New York march alone. Protesters elsewhere also celebrated large turnouts. A Twitter feed at the march's website showed crowds of demonstrators marching in Perth and Melbourne, in London and Dublin, and in Johannesburg and Tanzania. 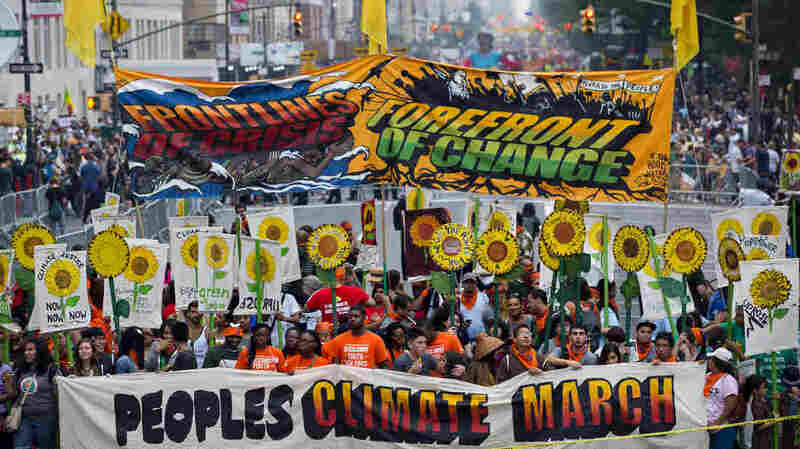 As NPR's Joel Rose reports from New York, the idea for the huge march started with professor and activist Bill McKibben as a way to push for actions that limit greenhouse gas emissions. U.N. Secretary-General Ban Ki-moon marched with the protesters, as did former Vice President Al Gore. "The stakes are the future of the planet," McKibben says. "And so far, we've seen essentially no action from world leaders that matter on this question." The organizers said some 2,800 events were planned around the world, with large marches in cities as varied as Bogota and Berlin, Rio and Istanbul. "McKibben says there will be no celebrity speakers, no stage and no speeches," Joel says. "But marchers are encouraged to bring air-horns, trumpets and other noise-makers to 'sound the smoke alarm for a planet on fire.'" Global climate change expert Jessica Hellman, a professor at Notre Dame, says the march "sends a strong message that everyone is affected by climate change." "We can still avert catastrophic change if we act quickly to reinvent our economy and our relationship to the Earth," she says, "but we must also find ways to live with the climate change that has already started. Corporations and the development community are already helping the world to adapt, but these efforts are not enough." An earlier version of this post referred to "former President Al Gore." He is former Vice President Al Gore.